My husband and I experienced this syndrome recently. Not from drugs or from alcohol but from computers, television, cell phone reception, and even radio. Yes, we were cut off from the civilized world of electronics. No news, Facebook, the Stock Market, or online games. Totally isolated from noise. The only thing we could hear was the sound of pounding surf from the Pacific Ocean, and the pounding rain on the roof of our newly purchased 32′ motor home equipped with surround sound for a huge flat screen TV and state of the art music system of which we couldn’t use. The only other sound that cut through the surf and deafening pounding rain was our cats howling. Serena was not happy she couldn’t get out of our new home on wheels and the constant buffeting from the wind that accompanied the rain, rocked her into absolute fear that was very apparent from her wide eyed panting position on our bed. Calm soothing words and constant stroking of her poor shaking body finally worked, but it was apparent we wouldn’t be taking her with us again. If there was an “again”. 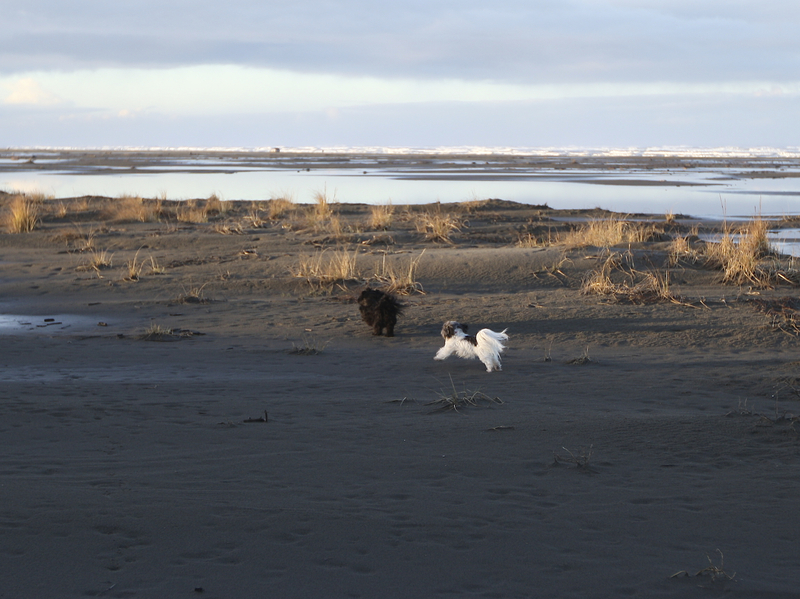 Our two little dogs, Cassie and Max took the whole experience in stride, because as long as the ‘humans’ were not frightened or upset they were happy to lay peacefully, heads cocked sideways each time the ‘rig’ rocked or the rain became too loud. The first ‘shake down cruise’ had been carefully thought out. 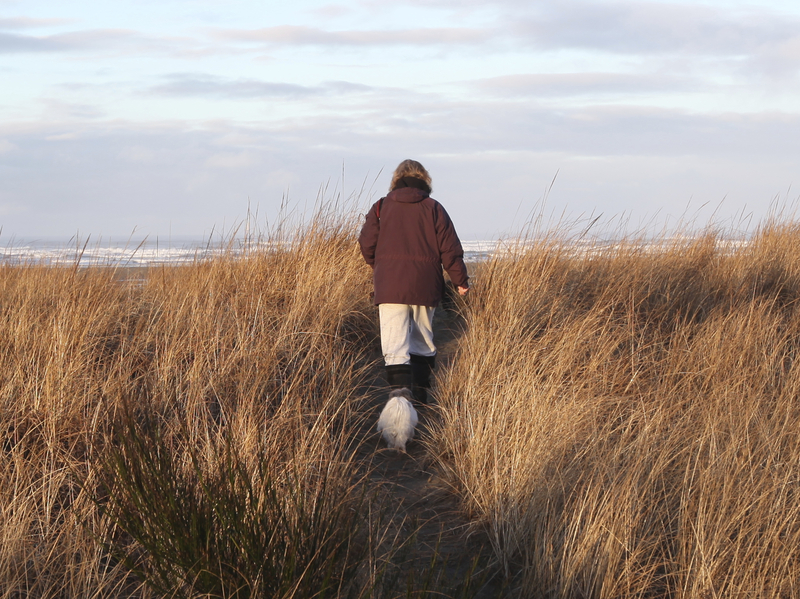 We had utilized all the previous campers who had picked this beautiful place in Grayland Washington’s State Park, reading their glowing reports on the web of how this park was very clean, with well kept grounds and facilities plus great close walking distance through the dunes to the ocean beach. We had reserved our space after seeing pictures of the site, nestled between tall evergreen trees, our own picnic table and fire pit, electrical outlet, and fresh water connection (plus disposal of same) which was all that we needed. What we hadn’t read was the lack of the creature comfort of electronics; i.e., WiFi, TV, or cell tower. We had packed enough for over a week stay although we only paid for three nights. Meals had been planned out and our stockpile of food, and snacks were enough for more than just the two of us. Wadders, clam gun, shovel, and buckets all neatly stowed in the ‘garage’ beneath the rig were ready for our razor clam excursion which we had come for during the three day open window to dig our fifteen per person, per day limit while we were there. Born and bred in the Pacific Northwest, I was accustomed to the rain, so although I knew it would be cold and wet, the thoughts of digging and cooking up a catch of the elusive clams outweighed all. The first day we arrived just two hours before the 4:30 start when we could legally dig. Cars and campers lined the beach, hoards of people ready to rush to the low tide, seeking little holes in the sand where the razor clams were just waiting to be plucked, dug or pulled up. We were tired from the drive so decided to give the first day a miss and just sit back, put our feet up and watch TV or play on our computers. 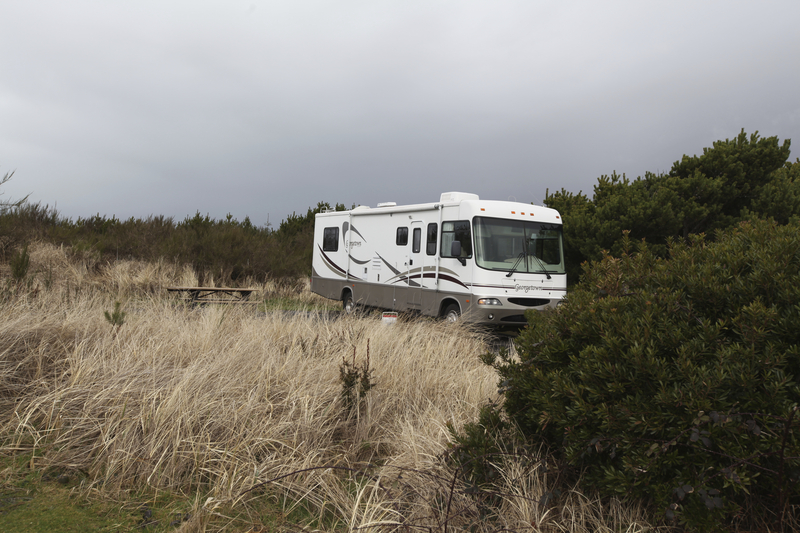 After getting settled, connected to water and electricity, ‘watering’ the dogs and reveling in the fact the place we had picked was truly clean and the other motor homes were tucked far enough away for privacy with trees separating each one, we sat down and turned on the big TV. Nothing! No signal! Oh well, onto the computer. Nothing! No signal! Cell phone the same. We looked at each other and almost simultaneously said, “Now what”? Then the rain hit. Not a drizzle but sideways, slapping stinging rain that hit the side of the rig (or your face if you dared venture out). “Three days, huh?” my husband says, reaching for the bookshelf. “Well tomorrow we can let the dog’s run free on the beach and we can go for a long walk” he said, settling down to start his new book. “Yup,” let’s hope this rain let’s up.” I said pulling my new novel down from the shelf and got comfortable in the little dinette and started reading. We decided to put our rain gear on and take the dogs out. Flash lights in hand we left our little fogged up home away from home, Cassie and Max in tow, and entered a world of total blackness. Only little lights from the other motor homes were visibly through the driving rain. As we walked past some of the bigger rigs we realized that most of them had satellite’s on their roofs, and of course they had television. “Duh” said my hubby. “Guess what we are getting next”! Thoroughly soaked with two very wet dogs, we were back in short order to towel off the dogs then make a cup of tea to stave off the cold and damp. That done, we realized just how weird it really felt being totally out of touch with what was our normal existence. It was only day one of our trip, and we were actually experiencing …..no noise. We were warm and cozy with an electric furnace, hot water, and a warm bed, but there was a vacancy we both felt. As we lay in our comfy bed we listened to the rain, which had lessened from torrential to almost a soothing tempo above our heads. For myself, withdrawal from the constant noise of television or the glare from the computer screen had calmed me somehow. The only noise besides the rain was Serena. Wandering around in the dark howling to get out. We decided she was more in withdrawal than we were. Eventually, both Cassie and Max found their way onto the small bed with us, and Serena curled up next to me purring. All was well with the world. Let the rain come down. Who needs the outside world and all it’s bad news and chaos. Funny how total blackness brings sleep naturally….. when you let it. And as luck would have it, the day we were to leave, the sun came out. We had about two hours to see the ocean. Next Next post: And….We are Published!